Nail-patella syndrome (NPS; OMIM 161200) is an autosomal dominant condition characterized by the classical clinical tetrad of nail dysplasia, patellar aplasia-hypoplasia, elbow arthrodysplasia, and iliac horns. 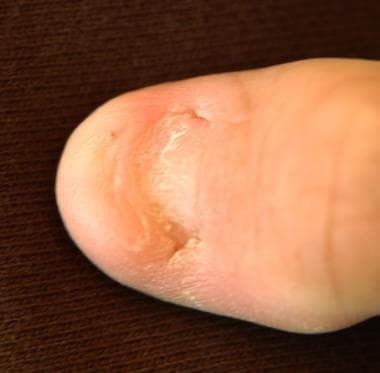 The nails may be absent, hypoplastic, or dystrophic with ridges, pits, and/or triangular lunulae. See the image below. Nail of a patient the nail-patella syndrome. Although the joint anomalies in nail-patella syndrome may limit range of motion (ROM), the associated glaucoma and nephropathy may be the most serious complication. Asymptomatic proteinuria may persist for years; however, end-stage renal failure occurs in less than 5%. Mutations in the homeodomain of LMX1B versus LIM-A or LIM-B may be associated with proteinuria. However, further investigation of a larger population of patients with nail-patella syndrome (ideally sporadic) is needed to determine if this genotype-phenotype correlation is valid outside large pedigrees of nail-patella syndrome, which may be simultaneously segregating nephropathy-related genes. Nail-patella syndrome has been recognized for more than 100 years. It has an estimated prevalence of 1 per 50,000 live births. Nail-patella syndrome has been described in multiple populations. The severity of clinical features and manifestations cannot be predicted. Orthopedic problems may be treated with analgesics, physical therapy, bracing, and/or surgery. With concurrent renal disease, nonsteroidal anti-inflammatory drugs (NSAIDs) must be used cautiously to avoid worsening renal function. If orthopedic surgery is planned, MRI prior to surgery is recommended because joint structures (ie, ligament, tendon and muscle insertions, vessel locations) are typically distorted in patients with nail-patella syndrome. Renal disease that manifests as proteinuria with or without hematuria occurs in 30-50% of patients, but progression to end-stage renal disease occurs in less than 5%. Hypertension and renal disease are treated as in the general population, with recognition that ACE inhibitors have been shown to slow progression of proteinuria in nail-patella syndrome. Patients who have undergone renal transplantation usually have good results. Glaucoma should also be treated as in the general population, but with increased surveillance in all patients with nail-patella syndrome (eg, annual ophthalmologic examination with glaucoma screening). Prenatal diagnosis based on ultrasonography detection of iliac horns is reported; talipes may also be detected on antenatal ultrasonography. Nail anomalies and contractures of the knees or elbows may be noted at birth. Abnormal patellae are often noted in early childhood. Renal disease may occur at any age. When present, the onset of glaucoma or ocular hypertension is usually in adulthood but at an earlier age than in the general population. Other disease manifestations span all ages. West JA, Louis TH. Radiographic findings in the nail-patella syndrome. Proc (Bayl Univ Med Cent). 2015 Jul. 28 (3):334-6. [Medline]. [Full Text]. Sweeney E, Fryer A, Mountford R, Green A, McIntosh I. Nail patella syndrome: a review of the phenotype aided by developmental biology. J Med Genet. 2003 Mar. 40(3):153-62. [Medline]. Romero P, Sanhueza F, Lopez P, Reyes L, Herrera L. c.194 A>C (Q65P) mutation in the LMX1B gene in patients with nail-patella syndrome associated with glaucoma. Mol Vis. 2011. 17:1929-39. [Medline]. [Full Text]. Chatterjee M, Chatterjee C. Nail-patella syndrome--a preliminary study for genetic linkage with ABO blood group. J Indian Med Assoc. 2010 Nov. 108(11):747-9. [Medline]. Bongers EM, van Kampen A, van Bokhoven H, Knoers NV. Human syndromes with congenital patellar anomalies and the underlying gene defects. Clin Genet. 2005 Oct. 68(4):302-19. [Medline]. McIntosh I, Dunston JA, Liu L, Hoover-Fong JE, Sweeney E. Nail patella syndrome revisited: 50 years after linkage. Ann Hum Genet. 2005 Jul. 69(Pt 4):349-63. [Medline]. López-Arvizu C, Sparrow EP, Strube MJ, Slavin C, DeOleo C, James J, et al. Increased symptoms of attention deficit hyperactivity disorder and major depressive disorder symptoms in Nail-patella syndrome: potential association with LMX1B loss-of-function. Am J Med Genet B Neuropsychiatr Genet. 2011 Jan. 156B(1):59-66. [Medline]. Dunston JA, Hamlington JD, Zaveri J, et al. The human LMX1B gene: transcription unit, promoter, and pathogenic mutations. Genomics. 2004 Sep. 84(3):565-76. [Medline]. Marini M, Bocciardi R, Gimelli S, et al. A spectrum of LMX1B mutations in Nail-Patella syndrome: new point mutations, deletion, and evidence of mosaicism in unaffected parents. Genet Med. 2010 Jul. 12(7):431-9. [Medline]. Clough MV, Hamlington JD, McIntosh I. Restricted distribution of loss-of-function mutations within the LMX1B genes of nail-patella syndrome patients. Hum Mutat. 1999. 14(6):459-65. [Medline]. Tigchelaar S, Lenting A, Bongers EM, van Kampen A. Nail patella syndrome: knee symptoms and surgical outcomes. A questionnaire-based survey. Orthop Traumatol Surg Res. 2015 Dec. 101 (8):959-62. [Medline]. [Guideline] Papnicolaou N, Francis IR, Casalino DD, et al. ACR Appropriateness Criteria renal failure. [online publication]. Reston (VA): American College of Radiology (ACR); 2008. [Full Text]. Bongers EM, Huysmans FT, Levtchenko E, et al. Genotype-phenotype studies in nail-patella syndrome show that LMX1B mutation location is involved in the risk of developing nephropathy. Eur J Hum Genet. 2005 Aug. 13(8):935-46. [Medline]. Chen H, Lun Y, Ovchinnikov D, et al. Limb and kidney defects in Lmx1b mutant mice suggest an involvement of LMX1B in human nail patella syndrome. Nat Genet. 1998 May. 19(1):51-5. [Medline]. Cormier-Daire V, Chauvet ML, Lyonnet S, et al. Genitopatellar syndrome: a new condition comprising absent patellae, scrotal hypoplasia, renal anomalies, facial dysmorphism, and mental retardation. J Med Genet. 2000 Jul. 37(7):520-4. [Medline]. Dai JX, Johnson RL, Ding YQ. Manifold functions of the Nail-Patella Syndrome gene Lmx1b in vertebrate development. Dev Growth Differ. 2009 Apr. 51(3):241-50. [Medline]. Dreyer SD, Zhou G, Baldini A, et al. Mutations in LMX1B cause abnormal skeletal patterning and renal dysplasia in nail patella syndrome. Nat Genet. 1998 May. 19(1):47-50. [Medline]. Dunston JA, Reimschisel T, Ding YQ, et al. A neurological phenotype in nail patella syndrome (NPS) patients illuminated by studies of murine Lmx1b expression. Eur J Hum Genet. 2005 Mar. 13(3):330-5. [Medline]. Fong EE. Iliac horns' (symmetrical bilateral central posterior iliac processes):a case report. Radiology. 1946. 47:517-518. Galloway G, Vivian A. An ophthalmic screening protocol for nail-patella syndrome. J Pediatr Ophthalmol Strabismus. 2003 Jan-Feb. 40(1):51-3. [Medline]. Krawchuk D, Kania A. Identification of genes controlled by LMX1B in the developing mouse limb bud. Dev Dyn. 2008 Apr. 237(4):1183-92. [Medline]. Lemley KV. Kidney disease in nail-patella syndrome. Pediatr Nephrol. 2008 Jun 6. [Medline]. [Full Text]. Mimiwati Z, Mackey DA, Craig JE, Mackinnon JR, Rait JL, Liebelt JE. Nail-patella syndrome and its association with glaucoma: a review of eight families. Br J Ophthalmol. 2006 Dec. 90(12):1505-9. [Medline]. Decreased severity of nail dystrophy towards the fifth finger and loss of skin creases over the distal interphalangeal joints. Courtesy of Journal of Medical Genetics, BMJ Publishing Group Ltd.
Triangular lunules. Courtesy of Journal of Medical Genetics, BMJ Publishing Group Ltd.
X-ray of pelvis showing iliac horns. Courtesy of Journal of Medical Genetics, BMJ Publishing Group Ltd.
X-ray of pelvis showing iliac horns in early childhood. Courtesy of Journal of Medical Genetics, BMJ Publishing Group Ltd.
Lester's sign of the iris. Courtesy of Journal of Medical Genetics, BMJ Publishing Group Ltd. The authors and editors of Medscape Reference gratefully acknowledge the contributions of previous authors Suzanne M Carter, MS, and Susan J Gross, MD, FRCS(C), FACOG, FACMG, to the original writing and development of this article.